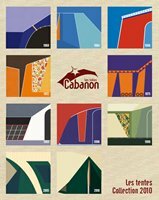 Cabanon is a very well established tent and trailer tent manufacturer, having been in business since 1960. They are based in France however Cabanon products are sold throughout Europe and beyond. Cabanon trailer tents are easy to tow, thanks to the light yet safe trailer body which holds everything you need for your camping trip. Once on site, the clever erecting system means you will simply and quickly begin to appreciate the benefits of the large off-the-ground beds, spacious living area and the possibility of an integrated kitchen. These features, coupled with the quality, durable canvas and strong frame system will ensure wonderful camping holidays. The Cabanon Mercury is a 4-8 berth trailer tent with 2 large double beds and space for 2 optional under bed tents. It has a large size awning with full zip in groundsheet and an integral sun canopy. The Cabanon Orion is a 2+2 berth trailer tent which can be used without the need to peg the sleeping cabin. The Cabanon Manga is a 4-8 berth trailer tent with 2 double beds and space for 2 optional under bed tents. It has a good size awning with full zip in groundsheet and an integral sun canopy. The Cabanon Malawi is a 2-4 berth trailer tent with 1 double bed and space for an optional annex fitted to the optional awning. The awning is 2.5m deep and can have an optional groundsheet. The Cabanon Chamonix is a 4-8 berth trailer tent with 2 large double beds and space for 2 optional under bed tents. It has an extra large size awning with full zip in groundsheet and an integral sun canopy. The Cabanon Columbia is a 4-8 berth trailer tent with 2 large double beds and space for 2 optional under bed tents. It has a large size awning with full zip in groundsheet and an integral sun canopy. The Cabanon Jaguar is a 4-8 berth trailer tent with 2 double beds and space for 2 optional under bed tents. 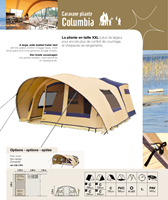 It has a 2.5m awning with optional groundsheet and sun canopy. The Cabanon Stratos is a great family trailer tent, sleeping up to 4 adults and 4 children. There is a huge 3.5m living area and an extra 2m of awning area to enjoy. The Cabanon Tabora is a 2-4 berth trailer tent with a single large bed and ample seating space. It has a spacious cooking / living area with fitted groundsheet and a fold-over cooking table.